*This is a guest post from my mum, Jane Dyson! In these days of electricity and instant light available at all times, it’s difficult to imagine how frightening the night could be for our distant ancestors. Watching the sun rise takes us back to that early reassurance that day would follow night, as well as providing a beautiful spectacle in its own right. The following examples are places where the location helps to enhance the whole experience. So, here’s my list of the five most incredible places to watch the sunrise from my own adventures around the globe. The gradually lightening sky wakes us up; the stars that kept us company in the black night are no longer visible but a hint of pink on the horizon suggests where the sun will eventually appear. The hint of a chill on the desert wind encourages us to snuggle down in our beds, which are surprisingly comfortable for basic charpoys, with mattresses and slightly ratty quilts. We stare at the scene before us – when we were shown to our beds last night it was already dark, but now we can see that we are in the middle of a stereotypical desert with rolling sand dunes and occasional scrubby bushes. From time to time a loud bang indicates that the Diwali fireworks of last night have not all been used up yet. Slowly, slowly, the light increases, bringing an outburst of bird song, until at last we catch our first glimpse of the morning sun, just a sliver of light on the horizon. Now the pace increases and within a few minutes the full sun is visible in all its golden glory. The magic of the moment is broken when the jeep driver comes to fetch us back to the camp, a few hundred yards behind us across the sands, for a welcome shower and breakfast. The Thar Desert is in Rajasthan, a few hundred miles to the west of Delhi, around the city of Jaisalmer. 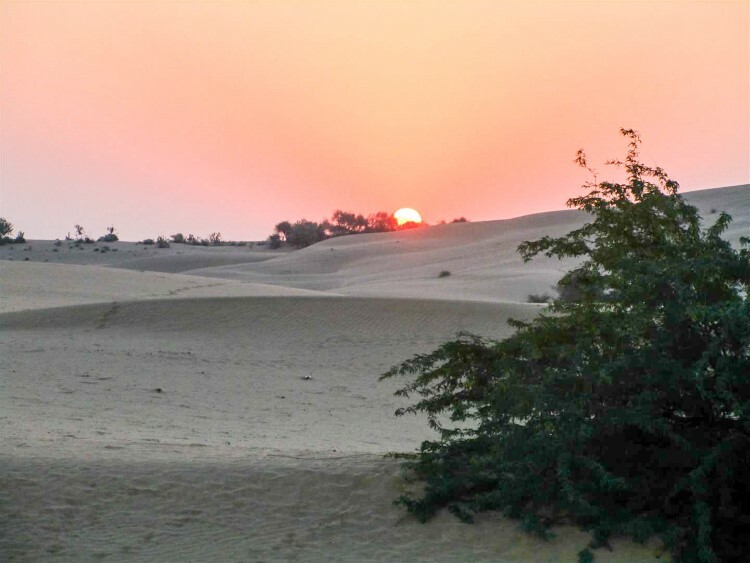 There are a number of “Desert resorts” offering overnight stays with camel trekking and a night in the desert with an excellent viewpoint from which to watch the sun rise. 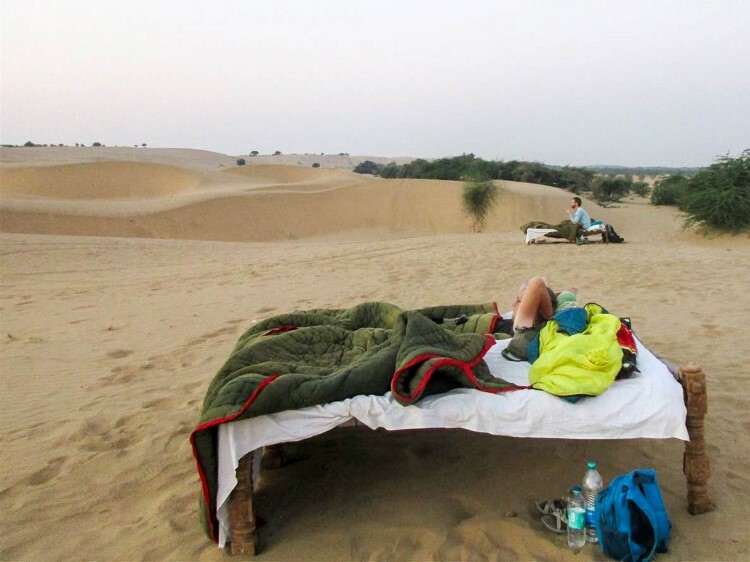 This can be organised via travel agents in Jaisalmer itself, or as part of a longer trip around Rajasthan. We are up well before the dawn, securing our rucksacks on the roof rack of the land cruiser in the dark. Our driver hurtles across the plain, finding his way along invisible tracks, until after an hour or so we find ourselves on what looks like ice, but is actually the salt flats. An “island” rises out of them, all sharp rocks and cacti; this is our destination. As we are shooed out of the vehicle, other cars turn up; sunrise on the island is part of everyone’s salt flat experience. We climb a well-worn path to the top of the island, dodging the cacti which loom beside us in the half-light. From the top, we look out on the vast white expanse of the salt flats which appear to stretch forever. To the east the sky starts to lighten and turn pink, then gold, and at last the sun appears. The cacti lose their ghostly appearance and the full beauty of their flowers becomes apparent. Many photographs are taken. We make our way slowly back down to the cars, to discover that our breakfast is a huge and very delicious cake. How and when did our cook manage to make that? A number of operators provide two- to four-day tours of the Uyuni Salt Flats in Bolivia. 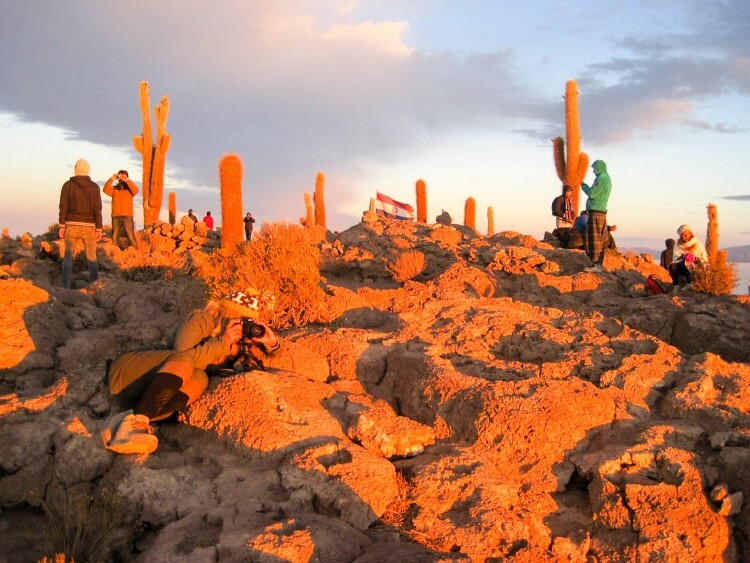 The recommended option is to start from Tupiza for a 4 day/3 night tour finishing in Uyuni. Highlights of this trip include multi-coloured lakes, flamingos, volcanos and hot springs as well as the salt flats themselves (one of the globe’s best places to watch the sunrise) and a night in a salt hotel. We leave the cars on the edge of the army base at Larkhill and walk down the green lane in the dark for a mile or so. We are checked through the entrance to the site and follow a steady stream of people past the food stalls towards the stones themselves. The site is busy, many have been here all night partying and are now lying, exhausted, on blankets on the ground. Although it’s impossible to see how even a single person more could squeeze into the space between the stones, we manage it somehow, enjoying the chance to actually touch the big sarsens. All kinds of people are here joyfully mingling and the air is full of chants and a constant drumming which increases our anticipation. As the hour of the sunrise approaches, all eyes turn to the East, and the drums intensify. The horn sounds to announce the moment and we see the sun briefly as it rises through the trees on the horizon before it disappears behind low cloud now tinged with gold. For most visitors, Stonehenge is a trek from the visitor centre (transport is available) clutching an audio guide and a circumnavigation of the stones on the roped off path, which helps to maintain a discreet distance between tourists and the stones. 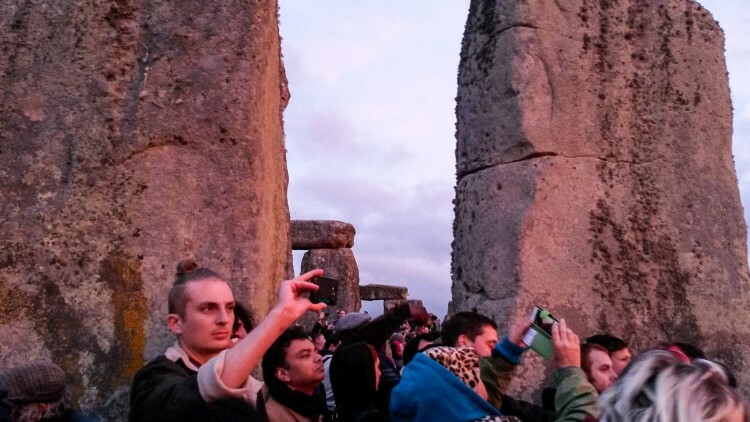 But twice a year, for a few hours, English Heritage makes the stones accessible to all-comers for the Solstice celebrations and allows visitors to experience watching the sunrise here. We choose our site carefully before unpacking our rucksacks and pitching our small tents. Running water is available in the small stream that runs down the centre of the valley, and we are far enough away from the cows that we won’t trouble them nor they us; no one wants a cow blundering into the tent in the dark. We are early to bed after cooking and eating a good evening meal, as befits those who have walked many miles to get here, and awake at first light to a hasty breakfast before packing away the tents and shouldering our rucksacks. As the sun rises it isn’t high enough to penetrate our valley, leaving us cold and anxious to get walking and warm up, but its progress can be monitored by watching it slowly lighting up the far side of the valley. We start the long climb upwards to meet it. 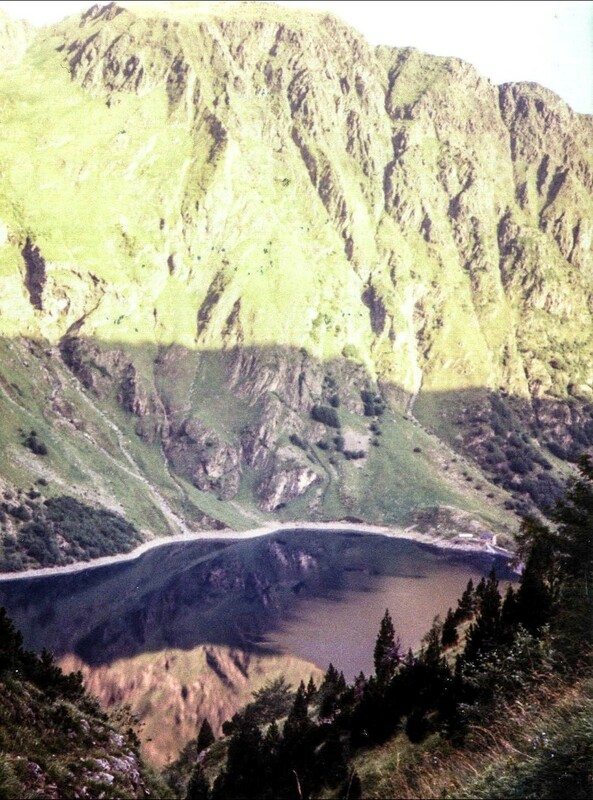 There are many footpaths in the French Pyrenees, most notably the GR10 which runs from the Atlantic to the Mediterranean coasts. They are usually well marked (the Gr10 has red and white flashes). You should ask permission from the landowner before wild camping, and in the National Park there may be restrictions, but a tent or two pitched discreetly and removed early in the morning will usually go without being noticed. Looking westwards across an apparently limitless ocean, shimmering in the dawn light, I can easily imagine that I am at the end of the world, only cold reason reminding me of the presence of America, a few thousand miles away. In the East, a few feathery clouds are stained pink and gold by the sun as it slowly struggles to lift itself from the horizon. The big statue of St James along the path is suddenly bathed in light as the sun at last rises. In Roman times this was believed to be the end of the world, hence the name. Medieval pilgrims continued their journey here after reaching Santiago da Compostella, so that they could pick up scallop shells from the beach to prove they’d made the full pilgrimage. They would also burn their old clothes here and set out to return in fresh clothing as a sign of their purification. Today the rocks at the far end of the peninsula are scattered with the remains of small fires, so something at least of this custom is still followed. 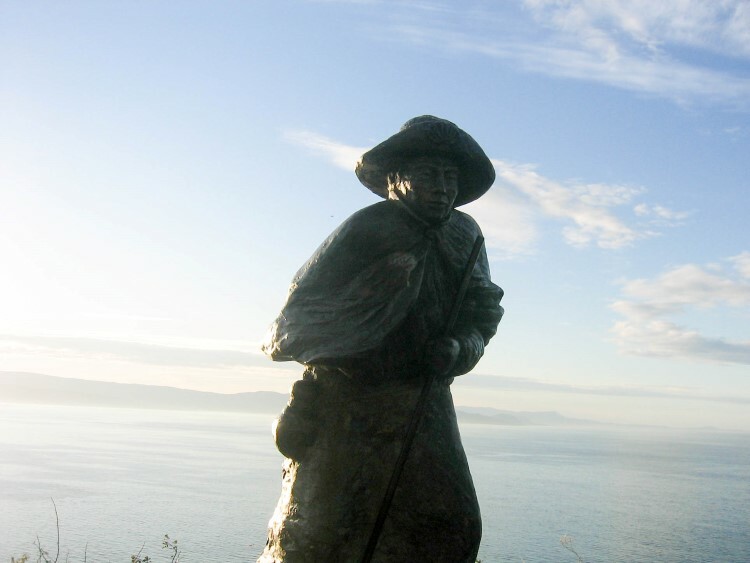 The traditional way to get to Cap Finisterre is to walk the final section of the Camino – the Way of Saint James – which extends from Santiago de Compostella to the village of Finisterre and on down the peninsula. This is a three-day walk along well-marked paths (with the same scallop shell that indicates all the Camino routes across Europe), with two albergues (pilgrim hostels) en route. You will need a Pilgrim “passport”, which can be obtained in Santiago to stay at these. However, for those who prefer not to walk long distance, there are buses out to Finisterre from Santiago, which itself is well connected with rail and bus links and even an airport. 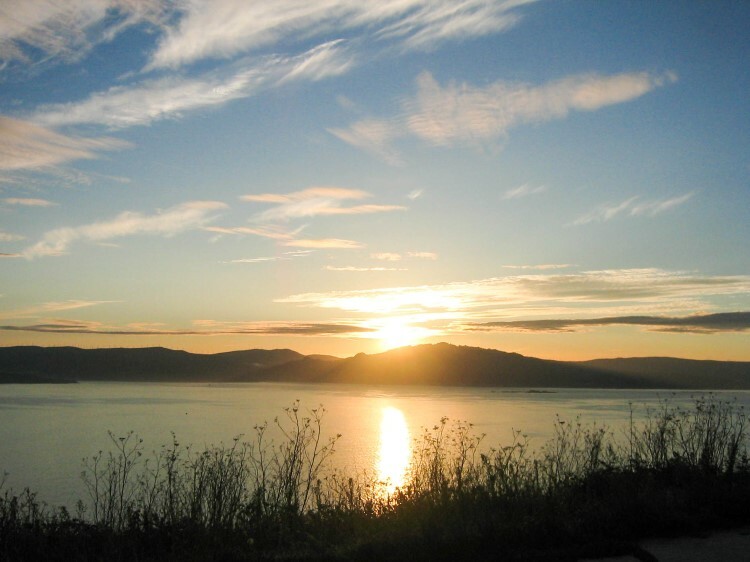 Where are the best places to watch the sunrise that you’ve even been? Have you got any other locations to add to this list? You know I’ve actually never been to any of these places, but I certainly wouldn’t argue with the Thar Desert. That sounds magical. Thanks for sharing! No problem Katie! I’m glad it gave you some inspiration!